China (mainland) Jiangsu Wuxi,No. 9, Longyun Rd, Zhouzhuang Town, Jiangyin, Jiangsu, China. 2. 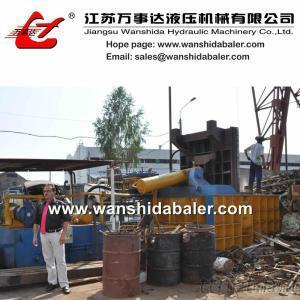 Application: Y83-3150Metal Baling For Scrap is suitable for the steel plants, recycling companies, ferrous & non-ferrous metal smelting industry to compress metal scrap(steel parings, waste steel, waste copper & aluminum, waste stainless steel, scrap from discarded automobiles) into acceptable furnace charges of cuboids, cylinders, octagons & other shapes, so as to reduce the cost of transportation & smelting, to speed up furnace charging. 4. Quality: This machine apply to ISO9001: 2000 standard. 2) Any problem, you can call us directly. Machinery, Metalworking Machinery, Metalworking Machinery/n.e.s.